Many people travel to Florida every year and are perfectly happy spending their time on the beaches or in the theme parks of Orlando. Those are some of the attractions Florida is famous for- and for good reason. There’s also a world of outdoor activities a little off the beaten path that are equally fantastic and beautiful but you’ve got to get out of the larger towns to see them. Florida has beautiful springs in the northern half of the state which are perfect for swimming, snorkeling and just relaxing in the pristine “old Florida” outdoors. There’s also national parks, state parks and other natural areas that really are “must see’s”. There’s also treasure. Yes, treasure. IF you know where to look. 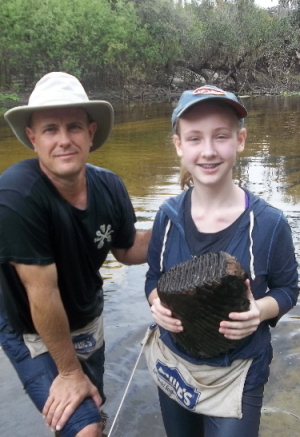 18.6 lb Mammoth tooth found by Indigo S.
There are remains from Florida’s ancient past hidden all over the state. 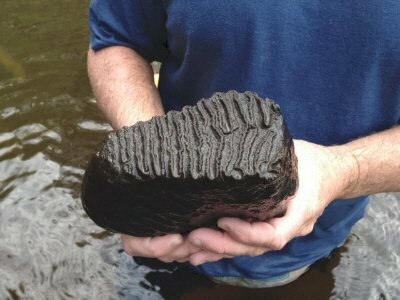 Millions of years ago, much of Florida was beneath the sea. Sharks, whales, dolphins and fish swam over almost all of the areas that are now dry land. As time went on, the seas retreated and Florida was home to the giant mammals of the ice-age- mammoths, mastodons, giant 20 ft ground sloths, saber tooth cats, 7 ft armadillos, jaguars, camels and herds of early horses. The fossils of many of those animals remain in the ground, waiting to be found by adventurous types who don’t mind getting a little dirty on vacation. In fact, getting dirty isn’t always a requirement. Fossils from all these animals can also be found in some of Florida’s river and streams. Finding them just takes a little know how about where to look and what to do. Digging gravel from shallow river bottoms works well. All you need are a shovel and a floating sifting screen to get started. Dig up some gravel, sift out the sand, and you’ll turn up shark teeth most often but many other fossils routinely turn up as well. 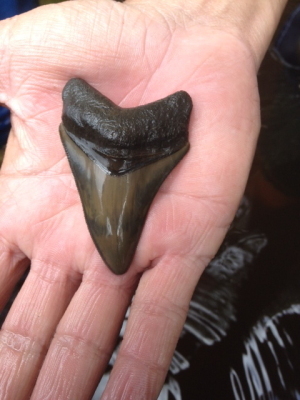 Megalodon shark teeth are some of the most highly sought-after fossils and they’re found in many of the sites we visit. What will YOU find on your fossil hunting tour……or vacation? 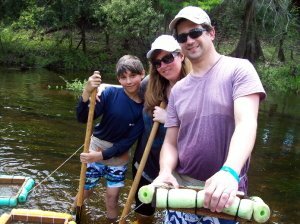 Paleo Discoveries’ fossil hunting tours generally take place in rivers and creeks in west-central Florida within driving distance of Orlando, Sarasota, Tampa, Fort Myers and West Palm Beach. Hope to see you on the river!